2017-07-28 Chongqing China Dynamics New Energy Automotive Technology Company Limited’s vehicle terminal remote control module has passed rigorous mandatory inspection. The test report shows that the functions of our on-board vehicle terminal meets the requirements of the National Motor Vehicle Quality Inspection which includes data acquisition, storage, transmission and replacement, independent operation, and remote control. 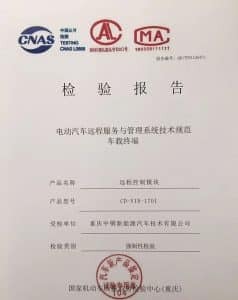 Prior to this, our advanced Cloud Networking System has passed the platform conformance test and vehicle compliance test of the National New Energy Vehicle Monitoring and Management Center. Our company’s vehicle networking big data platform, China Dynamics Cloud Platform and remote intelligent control terminal are the first batches in China that have passed the National New Energy Monitoring platform and the China Automotive Engineering Research Institute. Recently, we joined the China National New Energy Great Data Alliance as a founding member. China Dynamics Cloud Platform integrates new energy automotive vehicle control, data acquisition (vehicle terminal and data exchange platform), and the entire industrial chain of the vehicle monitoring platform which eventually forms a single vehicle enterprise platform to develop a unified multiple vehicle enterprise big data management platform.